Not many films have faced as many makeup challenges as Peter Jackson’s “The Hobbit: An Unexpected Journey”: hundreds of characters, fantasy worlds and creatures, heaps of prosthetics, constant integration with CGI and vfx, and the first-time use in a major motion picture of 48-frames-per-second technology, which drastically alters the look of the finished film, making it smoother and, some say, more realistic and subject to greater scrutiny. And that’s not even considering that it comes on the heels of one of the toughest acts to follow in cinema history: “The Lord of the Rings” trilogy, also helmed by Jackson, of which “The Hobbit” is a prequel, set 60 years earlier. Perhaps the most daunting test of all was the creation of makeup for the pic’s 13 dwarf characters, all of whom featured highly detailed makeups and unique, distinctive hairstyles. 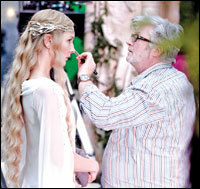 “Having (to deal with makeup) for 13 dwarves was a mammoth task for prosthetics,” says makeup department head Peter King. “We had many stages of preparation: drawings, sculptures of them all, then pulling our first prosthetics out of the molds, and doing our first tests with hair, beards, and wigs. After King arrived at the dwarves’ final looks, a template was set for 266 days of filming over 18 months of principal photography, handled by a 37-person makeup and hairstyling team. New Zealand-based special effects and prop house Weta Workshop created the prosthetics. WW founder Richard Taylor supervised the work. But the task didn’t end with the 13 main characters’ primary makeups. “Apart from our 13 dwarves, (we had to make up) 13 stunt doubles, 13 scale doubles, eight or nine scale stunt doubles, as well as a similar number of photo scale doubles in the distance in masks,” says King.